Since I am missing my favorite Berry Bitten smoothie, I opted to try out those with "berries" on their names. Hopefully, one of them might come close to that flavor I always crave. When I attended the soft opening of the Jamba Juice EDSA Shang branch, I finally had my share to try Banana Berry, upon the suggestion of an ambassador! My first sip of it was... wow! This one is almost like Berry Bitten! But I was so busy during the event that I wasn't able to experience it well. 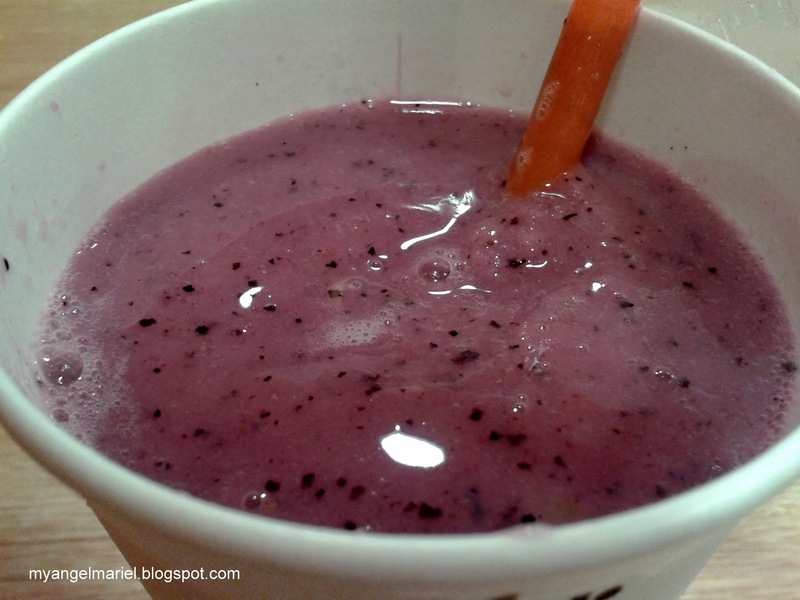 So I went back a week later to savor Banana Berry the way a food blogger should! I read the short recipe written on the menu board. The ingredients are bananas, blueberries, apple-strawberry juice, nonfat yogurt, and raspberry sherbet. And let me say this again, the taste is close to Berry Bitten. Banana Berry has a strong berry flavor, but it is less sour and seedy compared to Berry Bitten. With every sip hits the taste of blueberries and a hint of sweetness of bananas. The sourness comes from the nonfat yogurt and the raspberry sherbet. It also has that glassy look that I love see. Banana Berry is bursting with smooth blend of fruity flavor! The coldness of this drink makes it a good companion in this sunny weather! I love every part of this smoothie! Blueberries, raspberries, yogurt, you name it! It looks good and tastes even better! With the absence of Berry Bitten, this one makes it in my top favorite list! Kettle Korn: Poppin' Fun All The Time!